Dietary supplements have the role of providing your body with natural ingredients to improve comfort, reduce pain and inflammation, and other health benefits. In the case of joint health supplements, the focus is one providing your cartilage with the needed ingredients to prevent aging and increase mobility. As we all age, the cartilage that keeps the joints from rubbing together becomes stiffer, and that is why it is much necessary to help it retain enough liquid to allow flexible movement. LifeSeasons Mobili-T is a product that combines some of the necessary ingredients for joint health, and it promotes more flexibility, less pain, and more overall comfort, so you do not have to deal with inflammation and pain every day. What Does LifeSeasons Mobili-T Contain? The product does not contain shellfish, which is good news for people with allergies. We notice the presence of important ingredients like glucosamine, MSM and chondroitin. All are well known for their effects in improving the quality of the connective tissue, reducing pain, and inflammation. Turmeric extract is another great addition, being a herbal remedy used traditionally for reducing pains and inflammation in the joints. However, the product does not contain hyaluronic acid, which can contribute greatly to the overall health of your joints. You will have to take four capsules daily to see effects. You will have to pay 34.99USD for a bottle with 100 capsules, or 25 servings. You can also order a trial sample with 20 capsules, for 9.99USD. There is no clear guarantee offered with your purchase, so you need to contact the company on your own to ask about any issues that may appear with your order. 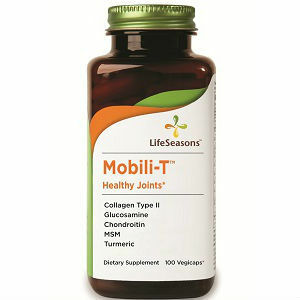 The formula used for LifeSeasons Mobili-T sounds like a potent one, since it contains the three most efficient ingredients for joint health: glucosamine, MSM and chondroitin. However, the fact that there is no hyaluronic acid listed is not so great. On the positive side, this product does include a herbal remedy, turmeric extract, to enhance the effects of the key ingredients and help against joint aging. Mark Stevens	reviewed LifeSeasons Mobili-T	on June 21st	 and gave it a rating of 2.